Springtime is a good time to take that bike out, polish it to a shine and get out on the road. 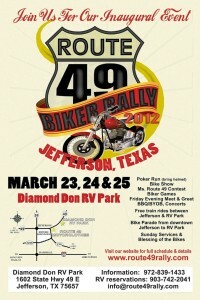 The end of March Jefferson Texas has a new biker rally called Route 49 Rally. March 23-25, 2012 is the inaugural event. During the weekend there will be a Poker Run-bring your helmet so you are all safe, Bike show, Ms. Route 49 contest, Biker games, Friday evening meet and greet, BBQ and concerts. Experience a free train ride between Jefferson and the RV Park; ride in a parade from downtown Jefferson to the RV Park just outside of town. Then cap off the weekend with Sunday morning services and Blessing of the Bikes led by Steve Wise. During the Friday night Meet and Greet enjoy the music of “Diddley Squat” a blues band. Saturday night main event band is the tribute to ZZ-Top band “Velcro Fly”. 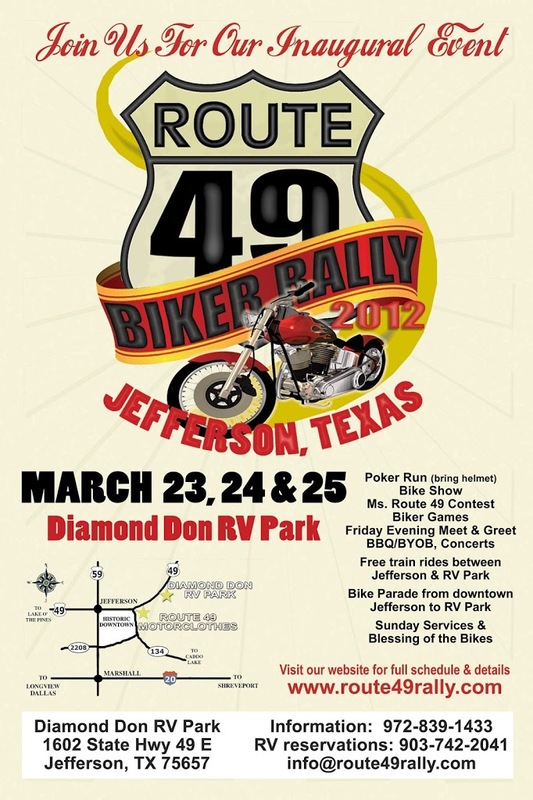 More bands during Saturday still to be determined, check the Route 49 Rally site for more information. While you’re there be sure to visit with the team of James Novey and Diamond Don Rainey and their support team of volunteers. Make sure to book your reservations early at the White Oak Manor bed and breakfast in Jefferson Texas.